I don't know what's up with me lately but, I have been on a major spicy tomato based soup kick lately! Last week I posted Buffalo Wing Soup and this week is this yummy spicy soup, Bloody Mary Soup. This is also a great soup because not only is it easy, it is quite thrifty!! I spotted this recipe in last months issue of All You magazine and immediately cut it out and put on my fridge door. I did change the recipe a little bit. big surprise huh? LOL Instead of using heavy cream for the topping I used sour cream. I think the next time I make this soup I am going to at least double it! LOL Not to mention, I would love to have a quart of it in the fridge to warm up whenever I wanted something tasty and quick. 1. Make soup: Melt butter in a pot over medium heat. Add onion and celery and cook, stirring, until softened and translucent, about 5 minutes. Add garlic and sauté 1 minute, then add Worcestershire sauce and sauté 1 minute longer. 2. Open tomato cans and cut tomatoes (still in cans) with kitchen shears into large chunks. Add tomatoes and juice to pot, along with salt and pepper. Increase heat to high and bring to a boil, then reduce to a simmer and cook 20 minutes, stirring occasionally. Remove from heat and stir in horseradish. Let soup cool 10 minutes, then puree in blender in batches and pour through a strainer into a large pan. Keep warm. 3. Make topping: mix sour cream and horseradish. 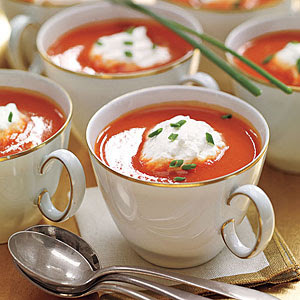 Divide soup among 8 cups and top with a dollop of horseradish cream. Garnish with chopped chives, if desired. I am joining up with these awesome yummy blogs! This is a keeper. I love anything spicy and tomato! how yummy. I bet you have a wonderful dish just like that to put it in.